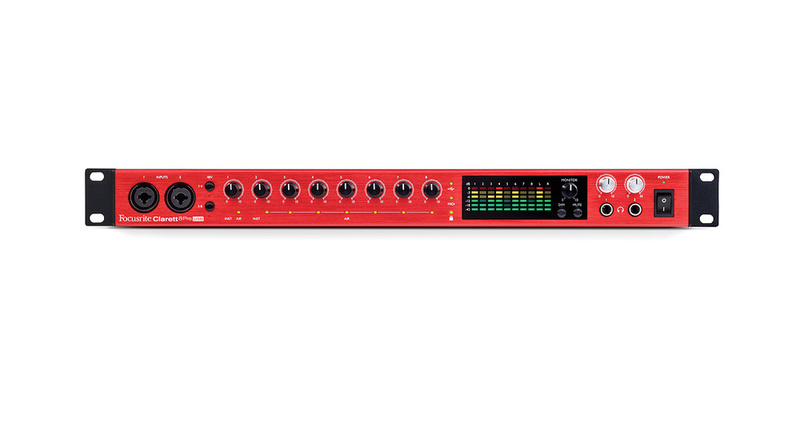 Focusrite’s new Clarett range drops Thunderbolt for USB and sheds a few pounds into the bargain. Launched in 2015, Focusrite’s Clarett range broke new ground in several ways. Previous Thunderbolt audio interfaces were mostly targeted at professionals, but the keenly priced Claretts were intended to appeal mainly to project studio owners. Their design saw a new emphasis on low-latency performance, not always a strong point of previous Focusrite interfaces; and the Claretts also featured audio specifications to rival much more expensive units. This last aspect of the range proved more of a selling point than Focusrite expected, and although other manufacturers have caught up to a greater or lesser extent in the three years since the range appeared, the Claretts remain something of a benchmark in this department. Having thus established the template for mid-priced Thunderbolt interfaces, Focusrite then turned their attention back to USB. Introduced last year, the second-generation Scarlett interfaces offer much better low-latency performance than the originals. They also perform perfectly well from an audio point of view, but Focusrite’s desire to bring them to market at a lower price than the Claretts means the second-generation Scarletts lag behind somewhat in the specs department. This led to a situation where Focusrite had nothing to offer people who are willing to pay extra for that last inch of sound quality, but can’t or won’t buy a Thunderbolt interface. Focusrite clearly think that this is a significant market, because they’ve now catered to it with a range of three Clarett interfaces that, as the name suggests, have USB rather than Thunderbolt connectivity. There is no USB version of the flagship Clarett 8PreX, so Focusrite supplied the USB version of the Clarett 8Pre for review. This is identical in almost every respect to its Thunderbolt counterpart, and even scores over its predecessor by actually shipping with the cables needed to use it. In fact, as the interface itself uses the new Type C USB port, it comes with both a double-ended Type C cable and an adaptor cable to connect to computers with the older USB Type A ports. I used the latter, and had no compatibility problems at all. 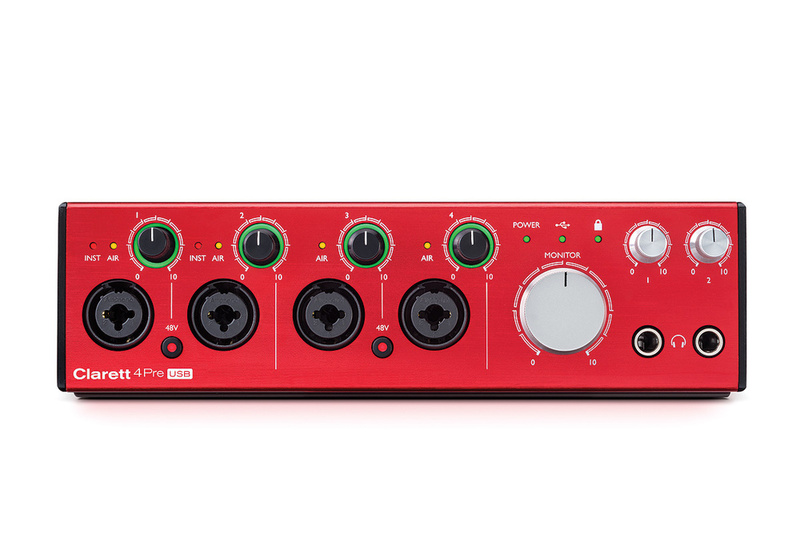 Focusrite Clarett 4Pre USB.Apart from the substitution of the Thunderbolt port for the Type C port, the external layout is unchanged. This means we get two combi mic/line/instrument sockets on the front panel and a further six mic/line inputs on the rear, all controlled using analogue gain potentiometers. Phantom power is switched in two banks of four inputs, and the accompanying Focusrite Control software provides per-channel switching of the Air circuitry, which adds a seductive but unsubtle high-frequency lift. There’s a stereo pair of main outputs plus eight further line outs, all on quarter-inch jacks, and two independent headphone sockets on the front panel, along with effective ladder meters for the inputs and main outs. As far as those all-important audio specifications are concerned, the USB version is not quite identical with its antecedent, but the two are within a dB or so on every important measure. Focusrite explain that any variations are down to different component choices that reflect what’s available three years on from the Claretts’ launch. I don’t think many people will have cause for complaint. Focusrite Clarett 2Pre USB.In theory, then, the Clarett USB interfaces combine the audio quality of the Thunderbolt Claretts with the driver performance of the second-generation Scarletts, and this is exactly what happens in practice. On Mac OS, both Scarletts and Clarett USB uses Apple’s driver for class-compliant devices, with the option to install a separate proprietary utility to bring the latency down a little further. Performance was, as far as I could tell, identical, so although both the latency and system overhead are slightly higher for a given buffer size than you’d get with the Thunderbolt Claretts, it should still be possible to achieve a round-trip latency of 5ms or below on any modern computer. I encountered no compatibility issues at all using the Clarett 8Pre with older USB connectors, and since Thunderbolt 3 now includes USB 3.1, it should also be possible to connect the USB Claretts that way too (though of course you’d still get USB performance rather than Thunderbolt performance). 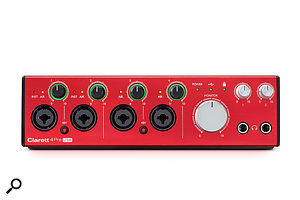 Beyond the fact that there is not a USB Clarett 8PreX, then, the new range doesn’t introduce any real negatives. Equally, Focusrite haven’t added any major new improvements either, but with the possible exception of the rather basic monitor control features, there weren’t many weaknesses in the Clarett design to start with. The USB Claretts probably face more competition than do the Thunderbolt versions, and of course not everyone will feel that the better audio specs justify the additional cost compared with the Scarlett range — but it’s nice to have the option! The most obvious rival to the Clarett 8Pre is the Studio 192 from PreSonus, which offers additional features including digitally controlled preamps, better monitor control and a talkback mic, but does not quite match it in terms of audio specs, and has less good low-latency performance. Zoom’s UAC-8 also deserves serious consideration, as do Tascam’s US-20x20, Steinberg’s UR824 and MOTU’s 828X. Focusrite have chosen not to make a USB version of the top-of-the-range Clarett 8PreX, which means there are only three interfaces in the Clarett USB range. As well as the 8Pre described in the main text, these are the Claretts 2Pre and 4Pre. Both are desktop rather than rackmounting units and, as the name suggests, they have two and four combi jack/XLR inputs respectively. The first two of these can accommodate instruments as well as mic and line-level signals. Both also feature an ADAT optical input, handy for those occasions where you need to track a drum kit or a full band, and the 4Pre adds S/PDIF and a second headphone output. The 4Pre cannot be bus-powered, but a firmware update issued as we went to press makes it possible to run the 2Pre from bus power if you have a Type C USB socket that can deliver 15W. Makes the impressive audio quality of the Clarett interfaces available in a USB format for the first time. Though not quite a match for the Thunderbolt Claretts, driver performance is still pretty good. There’s no USB version of the flagship Clarett 8PreX. The process of choosing a USB interface just got harder, thanks to the arrival of another very strong contender. The USB Claretts offer the same excellent audio specifications as their Thunderbolt cousins, in a more universal connection format. Clarett 8Pre USB £739, 4Pre USB £549, 2Pre USB £369. Clarett 8Pre USB $799.99, 4Pre USB $599.99, 2Pre USB $399.99.